Madrona Fiber Arts Winter Retreat was a blast. If only I could knit like Stephanie. Have you ever seen her knit? She tucks her right hand needle into her armpit so that it doesn’t move. 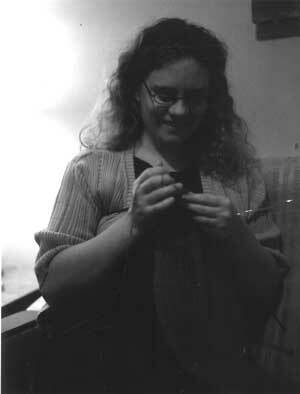 Here’s a photo from her blog (June 22, 2004). But, it doesn’t quite capture the technique. You have to see it for yourself. So, this leaves me wondering about the cover of Knitting Rules. What a picture! Same sweater and yarn choice, I think, but it looks a bit different on each person. Just wonderful! It should leave you wondering about the cover. Hell. It left me wondering and I was at the shoot. What an amazing photo. Look at all of you in your Kauni’s! I just told my husband that this is a Sweater Cult. :)!